If A Martin Placepick wins his way into the $500,000 Newhaven Park Country Championships Final it’ll be nothing short of a triumph for his reluctant trainer Cecil Hogdson. When you listen to the tale of accident and injury the Coonamble trainer tells about the lightly raced six-year-old gelding it’s a wonder he’s racing at all. But racing he is, thanks to Hodgson’s patience and horsesmanship, and with five wins from 13 starts he’s stamped himself as the horse to beat in Sunday’s $150,000 WRA Country Championships Qualifier (1400m) at Dubbo. “Half of it is his own fault at times,’’ the 60-year-old trainer said. “When I first started on him as a young horse I said to people he was a good horse. I don’t know if they took much notice. “Then when I broke him in he had a bad back joint on him and a narrow foot and I thought he’d never get to the races. In mid-2016 Hodgson, a former jockey with three ex-jockey brothers, was preparing A Martin Placepick and stablemate A Magic Zariz for a trial in with some barrier practice. The pair passed that little test with flying colours but when A Martin Placepick was pulling up he ejected Hodgson and ran through a fence. On two other occasions the gelding removed his rider, including a fill-in trackwork rider, and got a bit too friendly with the fencework at Hodgon’s stables. In early 2017 he actually made it to the barrier trials at Narromine. “He went pretty well in the trial and I had him nominated for a race at Dubbo and he went lame,’’ he said. “I couldn’t see anything and I thought he had a chipped bone. The next week a splint came up on his shin and I was glad to see that because a splint isn’t as bad as a chipped bone. Eventually A Martin Placepick was ready to race as an early five-year-old. To illustrate the time it cost him, A Magic Zariz – who took part in that initial barrier test – had contested the 2017 Country Championships, made it to open company and won the Narromine Cup on the same day A Martin Placepick made his belated debut. “When he came out of the paddock last year he had a crook eye and that took months to get right,’’ Hodgson said. All is well now, touch wood, as A Martin Placepick finally has his chance to tackle the Country Championships and he’ll be Hodgson’s fourth runner in the Western Qualifier. A Magic Zariz ran eighth as a $6 chance in 2017 while Also A Star ($21) and Prettylittlefellow ($3.50) ran sixth and seventh respectively in 2015. Clearly, though, A Martin Placepick is Hodgson’s best chance though the prospect of saddling another favourite is the cause of some nerves to a man who is most comfortable on a horse’s back. 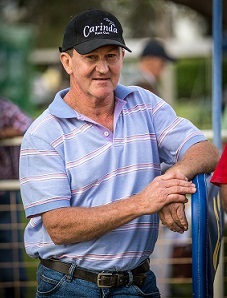 A slashing first-up second in the Gilgandra Town Plate (1100m) then a gritty win under Greg Ryan from an almost impossible position in the Australia Day Handicap (1400m) at Parkes on January 31 proved Hodgson has the leading contender. “I enjoy riding them, I hate training them. I just love riding work,’’ he said. “He’s like a greyhound, there’s no fat on him, and he’s a big horse and I thought Parkes might flatten him. First and second from the Dubbo Qualifier earn a spot in the $500,000 Newhaven Park Country Championships Final (1400m) at Royal Randwick on April 6.